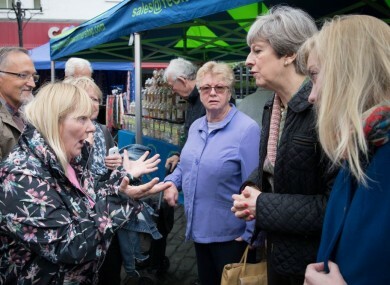 BRITISH PRIME MINISTER Theresa May was confronted by an angry voter over welfare cuts while she was campaigning today ahead of June’s general election. The woman, who gave her name as Cathy Mohan, said she had learning difficulties and challenged May over changes to state handouts for disabled people. “I can’t live on £100 (€118) a month,” she said. May, who has been accused of avoiding the public in the campaign ahead of the vote on 8 June, tried to answer Mohan but was interrupted. “The fat cats keep the money and us lot get nothing,” Mohan said in the Oxfordshire market town of Abingdon, west of London. May responded by saying “We’ve got a lot of plans” and that the goal was to ensure welfare payments are “focused on those who are most in need”. Some shoppers stopped to shake the prime minister’s hand during the 11-minute visit, and she posed for pictures. The prime minister called the snap vote in a bid to increase her parliamentary majority ahead of Britain’s complex talks to leave the European Union. Opinion polls give her Conservative Party a double digit lead over the main opposition, the Labour Party. Labour leader Jeremy Corbyn meanwhile drew large crowds at a campaign rally in Hebden Bridge in Yorkshire, northern England. Supporters who could not get inside the town hall filled the square outside — prompting Corbyn afterwards to come out and address them from the balcony. May later received several questions about her government’s cuts to disability benefits in a question and answer session broadcast on Facebook Live. Her debate received 16,400 reactions out of which, 10,000 were ‘angry’, 4,300 were ‘like’ and 1,200 were ‘love’. Email “Angry voter confronts Theresa May over welfare cuts”. Feedback on “Angry voter confronts Theresa May over welfare cuts”.